This winter has been fairly mild compared to some past winters. And yet, the kitchen is pretty chilly unless I am baking. So, today I decided to try baking something new while warming up my kitchen at the same time, Carrot Cupcakes with Pineapple Cream Cheese Frosting. Like many of you, I have a favorite carrot cake recipe that I use for cakes or cupcakes that my family enjoys eating with or without the cream cheese frosting. I thought it would be fun to embellish my carrot cupcakes with a pineapple cream cheese filling to evoke the sensation of the warm weather that I am so longing for. Pineapples always bring to my mind the image of summer. In the midst of winter, who could resist the thought of being whisked to a tropical island to sip pineapple infused drinks and eat juicy slices of fresh pineapple while taking in the breathtaking view of waves lapping against a sandy beach? 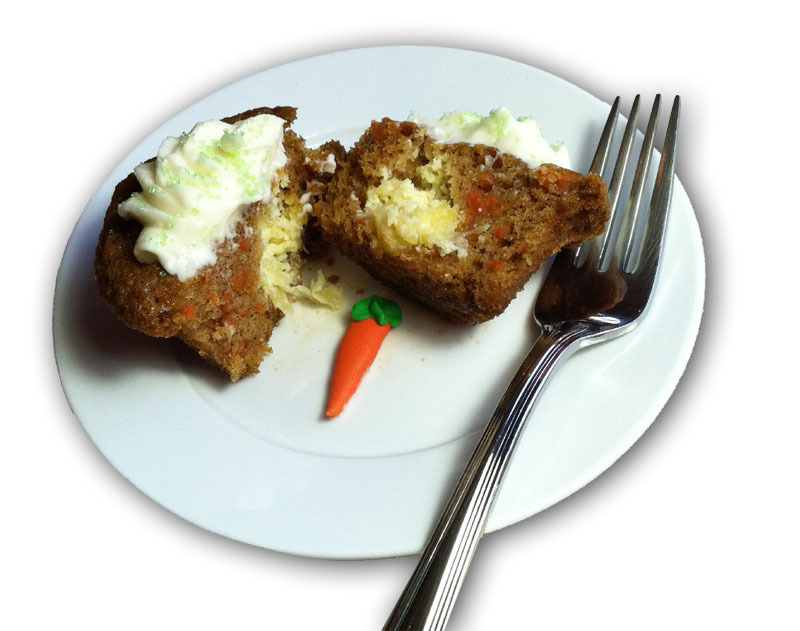 Use your favorite carrot cake recipe for the cupcakes. Prepare batter and fill 24 cupcake holders with 1 TBS batter add 1teaspoon Pineapple Cream Cheese Filling and then cover the filling with 1TBS batter. Beat the cream cheese and sugar until well blended. Add the egg yolk and dash of salt then add the strained pineapple. Set aside. Follow the recipe stated above. Bake cupcakes at 350°F for 30 minutes or until a toothpick inserted in the middle of one cupcake comes out dry. You can enjoy these cupcakes as they are or topped with your favorite cream cheese frosting.